Arrived safely today. Thank you for allowing me to continue the saga of Mma Ramotswe and friends. Mma Ramotswe accepts a case involving a woman who has amnesia. Meanwhile, Mma Makutsi has started her own business, a restaurant. And Mr. J.L.B. Matekoni must let go an employee from the garage due to decreased business. Since NancyNova was so kind to send this my way, I'm glad to find another reader for this book. Trade with bethieb for How I Killed Pluto and Why It Had It Coming. Mailed 02/26/17. Thank you ghir for this book from my wishlist! I've always enjoyed this series and will get to it soon. Thanks again to ghir for sharing this book with me. As always I enjoyed the lives of Precious and all the people who surround her. There seemed to be a theme to the book this time. The situations were all about helping others and wishing that the kindness would spread across the whole world. What a lovely idea! I'm sending this off to another fan of the series, ComradeCamper. It was a happy surprise to find this book in my mailbox this afternoon. That was quick! Thanks so much, bethieb. 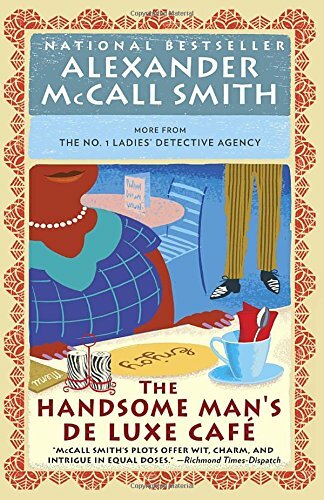 Alexander McCall Smith is one of my favorite authors. Somehow I had neglected the No. 1 Ladies' Detective series for awhile, and just rediscovered Mma. Ramotswe, Rra. J.LB. Maketoni, and Mma. Makutsi last week. Our summer reading program began June 1 at my local library, so this book arrived at just the perfect time. Sending a little honesty, common sense and kindness, in the form of Mma. Precious Ramotswe, to daffodil-2. After listening to the news today I felt the world could use a little more decency. Received in the post today from Comrade Camper. Thanks very much. Can't wait to read it as I love this series of books. Thanks also for the bookmark, postcard and details of the Quilt Show in Waukesha. Don't think I'll be able to make that one but maybe next time?? I have two other bookcrossing friends who also love these books so this one will be well-read in Norfolk, UK. REVIEW:- "How lovely to be back in Botswana and to read of the latest adventures of the detective agency ladies and their friends and colleagues. I laughed out loud for the first time on p 78 when reading about Mr. J. L. B. Matekoni practising "Pilates with cake" but by page 140 I was in tears as Charlie regretted his most recent bad behaviour. The story gently moved along, as I've come to expect, and came to a quite satisfying conclusion without being over-predictable I thought." I am reserving the book for two of my bookcrossing friends who both also love this series of books. This book will be travelling by post to my dear friend and fellow bookcrosser Lindashaul. I know she loves this series of books. I will ask her to return it to me in due course so I can pass it to Snoopy56.